My August 27th natural gas price forecast has held up well so far. Prices moved to as low as $4.62 very briefly and are now rebounding. There will likely be increased drilling for natural gas this year. In Canada, bad weather can sometimes keep the rig count down as wet fall conditions make it difficult to move drilling equipment to well locations. 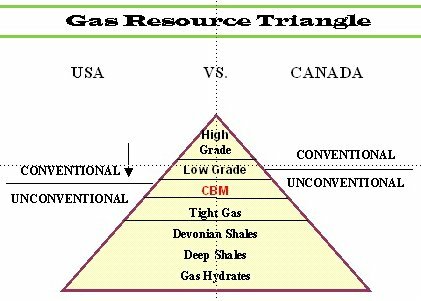 I want to illustrate the Resource Triangle concept to point out that an increase in well count will not necessarily lead to an increase in gas production. The Resource Triangle was outlined by John Masters and Jim Gray, of Canadian Hunter, back in 1979. It illustrates the log normal distribution of resources. The concentrated high grade deposits are the first to be discovered and exploited. Lower grade deposits form the base of the pyramid. They require higher prices and advanced technologies to be developed. We may not be running out of natural gas but the low hanging fruit has been picked. There was no commercial coalbed methane (CBM) production in Canada 5 years ago. Today there are hundreds of wells purposefully drilled to exploit CBM. The deliverability, or sustainable flow rate, for coalbed methane and tight gas reservoirs is significantly lower than that of conventional reservoirs. It takes more wells, more technology and more time to produce an equivalent volume of natural gas the further down the triangle you go. Most of the new wells are targeted at "unconventional" resources and it takes ~10-100 times as many wells to produce at the same rate that a conventional well would produce. Making the technology jump into unconventional resources can be extremely profitable. Porphyry copper deposits, tar sands and coalbed methane are all examples of resources that were uneconomic to exploit at one time.